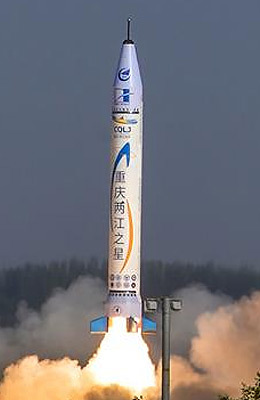 OS-X1 is a small solid fuel rocket designed by the Chinese company OneSpace as a suborbital demonstrator for their planned OS-M orbital rocket. Not much information on the vehicle is available. Possibly it is based on rocket motors inherited from the DF-11 or DF-15 missiles. The 6 m long vehicle can carry a payload of 100 kg to a height of 800 km. 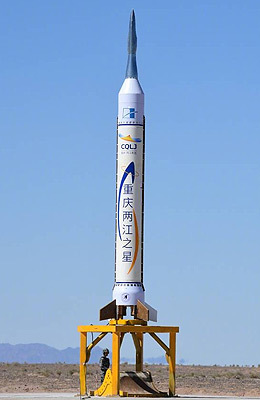 A first test launch of the OS-X1 rocket took place in May 2018 from a site at Alxa in northwest China. The solid motor burned for 35 seconds with maximum velocity more than Mach 5 and highest altitude about 40 km. A second flight took place in September 2018 from Jiquan and reached an altitude of 35 km. 1      1   OS-X1              16.05.2018 *  Alx        ? 2      2   OS-X1              07.09.2018 *  Jq         ?